My extended family gets together on all the big holidays. Lately, my relatives on a farm southeast of where I live have been hosting. My cousins are thoughtful folks and I enjoy talking with them about farming - and I was gifted with some homegrown lentils, homeground flour, and some borage seed. My one cousin is sitting on his RM's advisory board for a pilot project focusing on environmental stewardship. It's an area pocked with sloughs, and he was telling me about the benefits of leaving and/or aggregating the wetland areas in fields: increased biodiversity including pollinators and predatory insects, and less water erosion immediately spring to mind. He and his family also like to have cook-outs near one picturesque slough on their land. But lots of farmers like to drain wetlands and seed them, because driving around them takes more time and they want every bit of their land to yield a crop. My cousin figures this is a bit silly - often, the drained bits are still too wet to seed when the rest of the field is ready, then they get all weedy, and you have to spray more. Despite the benefits of maintaining the wetlands, my cousin estimated that maybe ten to twenty percent of farmers in his area would take up the practice. Flooding in Yellowgrass in 2011, picture courtesy of CBC Sask. 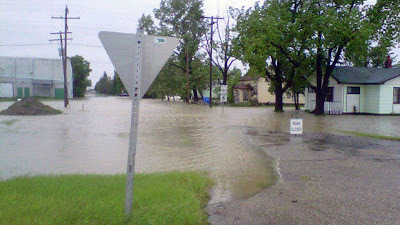 The spring of 2011 saw unprecedented torrential rains and flooding in a vast area of southern Saskatchewan. I don't think I'm crazy for suggesting that wetlands could have helped mitigate the damage, but apparently dams, dikes, and disaster assistance are the Saskatchewan answers. Manitobans probably don't think I'm crazy, either. Many of them have connected the dots and realized the importance of wetlands What will it take before Saskatchewan does too? Turns there's something else that provides the service of water retention and can reduce flood risk. Unfortunately, it also gets in the way of being able to drive a tractor in a straight line for miles. That's right - shelterbelts - which are going to become even more of an endangered species since the federal government cut funding to the PFRA shelterbelt program.